"David," she says. "Are you a hungry boy?" David coos and grins. "What about Davida? Is she hungry?" The killing of such "evil" babies takes many forms, including being suffocated, crushed, poisoned with a deadly mixture of plants and herbs, or left to die. Christian missionary Steven Olusola Ajayi opened the Vine Heritage Home in 2004, a shelter for so-called "evil" children. "If they are not here, I don't think any of them would be alive," Ajayi said. "They believe that leaving a child who lost his mother, that he is going to spread his evil that he used to kill the mother among the villagers, so they don't want them to live," Ajayi said. 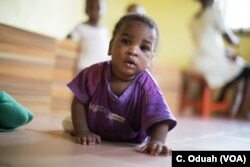 Of the 119 children at the rescue center, three-week-old Dominion is the youngest. Dominion's father brought the baby there after the mother died following childbirth. These days, some communities are willing to give away "evil children," rather than kill them. Ajayi says this is a sign of progress. "They don't kill them, but they don't want them," he said. It's also a sign his 20-year grass-roots effort is having an effect. "I advised my husband that we take them there," she said. "Twins don't survive here." But when asked why, she shrugged and looked away. Alkali Magaji is the spiritual leader of Kaida. "Our people believe that these children come from the evil one and no one wants it. We have a god we call Otauchi and we offer the children to that god. We suspect those children to be witches or wizards. That's why we eliminate them," Magaji said. Ayuba's mother-in-law gave birth to two sets of twins decades ago. The babies were killed, and afterward the family erected an altar. The family believes the spirits of the twin babies live in the altar, and twice a year the family offers sacrifices of chickens and goats to the spirits, believing this will prevent them from coming back to haunt the community. "There was need for enlightenment, education, so the communities would know ... medical science has a capacity to correct most, if not all, such defects. Billboards were erected in strategic places in those area councils, informing them that that practice was the stone-age practice and should not be done now where we have opportunity and exposure to science, education," Ashikeni said. In Kutara village, seven pairs of twins are living within the community. Ajayi said it's one of the first villages to end baby killings. The local chief, Bature Dangana, tells VOA he is happy seeing twins living among them. But in other communities, the practice has gone further underground, committed in deep secrecy. Samuel Tanko, a missionary working in Kaida, said a set of twins born there earlier this year has "disappeared," according to the local residents.